DFWCityhomes is an established flat fee MLS listing service and full service real estate company that represents buyers and sellers in DeSoto, Texas at a fraction of the cost. Our clients receive a full service experience with agent representation at all service levels and our simplified process is hassle free, proven, and effective. Interested in learning more? Click MLS Listing Services or Buyer Rebate Services to see how we may help you. Contact Us or Call (214)-207-0210 and we will explain to you how our services can save you time and money. Live, work and play in DeSoto, Texas a progressive community with a small-town feeling, rich in diversity and the cultural arts. Located in the "Best Southwest" - the southwest corner of Dallas County - DeSoto offers fine housing, friendly neighborhoods, a great school system, updated parks, restaurants and shopping. The DeSoto Independent School District is a small, suburban district that enjoys small town support of academics and athletics, along with taxpayer support for upgraded facilities, technology and instructional support. DeSoto is a city in Dallas County, Texas, in the United States. As of the 2010 census it had a population of 51,102. 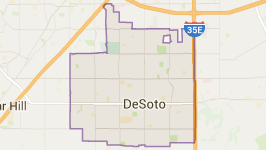 DeSoto is a suburb of Dallas and is part of the Best Southwest area, which includes DeSoto, Cedar Hill, Duncanville, and Lancaster.